Astronomers using the National Science Foundation's Very Large Array (VLA) radio telescope have discovered key evidence that may help them figure out how very massive stars can form. "We think we know how stars like the Sun are formed, but there are major problems in determining how a star 10 times more massive than the Sun can accumulate that much mass. The new observations with the VLA have provided important clues to resolving that mystery," said Maria Teresa Beltran, of the University of Barcelona in Spain. Beltran and other astronomers from Italy and Hawaii studied a young, massive star called G24 A1 about 25,000 light-years from Earth. This object is about 20 times more massive than the Sun. The scientists reported their findings in the September 28 issue of the journal Nature. Stars form when giant interstellar clouds of gas and dust collapse gravitationally, compacting the material into what becomes the star. While astronomers believe they understand this process reasonably well for smaller stars, the theoretical framework ran into a hitch with larger stars. "When a star gets up to about eight times the mass of the Sun, it pours out enough light and other radiation to stop the further infall of material," Beltran explained. "We know there are many stars bigger than that, so the question is, how do they get that much mass?" One idea is that infalling matter forms a disk whirling around the star. With most of the radiation escaping without hitting the disk, material can continue to fall into the star from the disk. According to this model, some material will be flung outward along the rotation axis of the disk into powerful outflows. "If this model is correct, there should be material falling inward, rushing outward and rotating around the star all at the same time," Beltran said. "In fact, that's exactly what we saw in G24 A1. It's the first time all three types of motion have been seen in a single young massive star," she added. The scientists traced motions in gas around the young star by studying radio waves emitted by ammonia molecules at a frequency near 23 GHz. The Doppler shift in the frequency of the radio waves gave them the information on the motions of the gas. This technique allowed them to detect gas falling inward toward a large "doughnut," or torus, surrounding the disk presumed to be orbiting the young star. 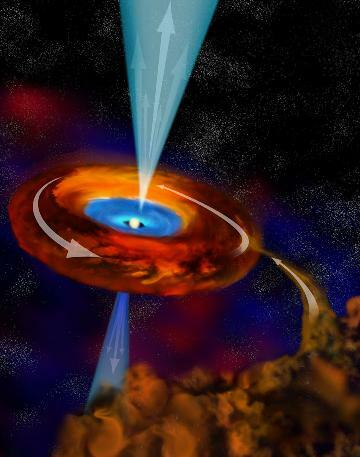 "Our detection of gas falling inward toward the star is an important milestone," Beltran said. The infall of the gas is consistent with the idea of material accreting onto the star in a non-spherical manner, such as in a disk. This supports that idea, which is one of several proposed ways for massive stars to accumulate their great bulk. Others include collisions of smaller stars. "Our findings suggest that the disk model is a plausible way to make stars up to 20 times the mass of the Sun. We'll continue to study G24 A1 and other objects to improve our understanding," Beltran said. Beltran worked with Riccardo Cesaroni and Leonardo Testi of the Astrophysical Observatory of Arcetri of INAF in Firenze, Italy, Claudio Codella and Luca Olmi of the Institute of Radioastronomy of INAF in Firenze, Italy, and Ray Furuya of the Japanese Subaru Telescope in Hawaii.